Kangaroo? In Australia they eat it all the time, and we get why. Absolutely delicous! 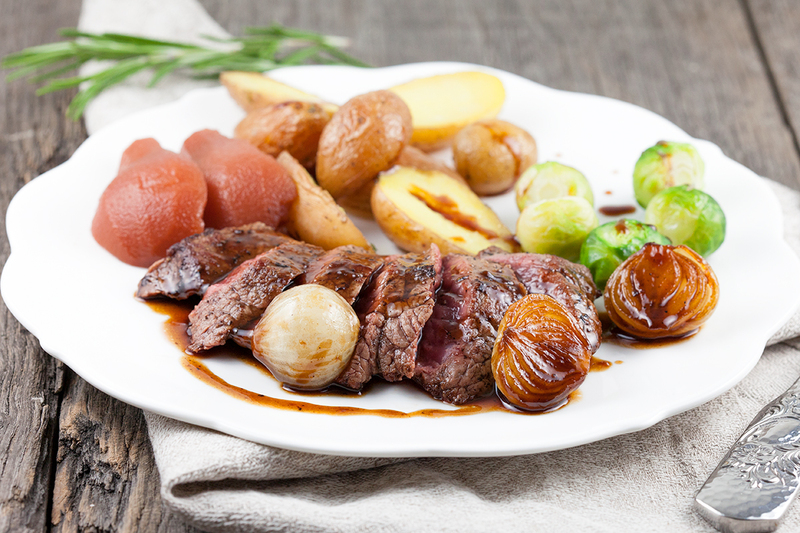 Kangaroo steak in syrup sauce is an amazing dish for the holidays. 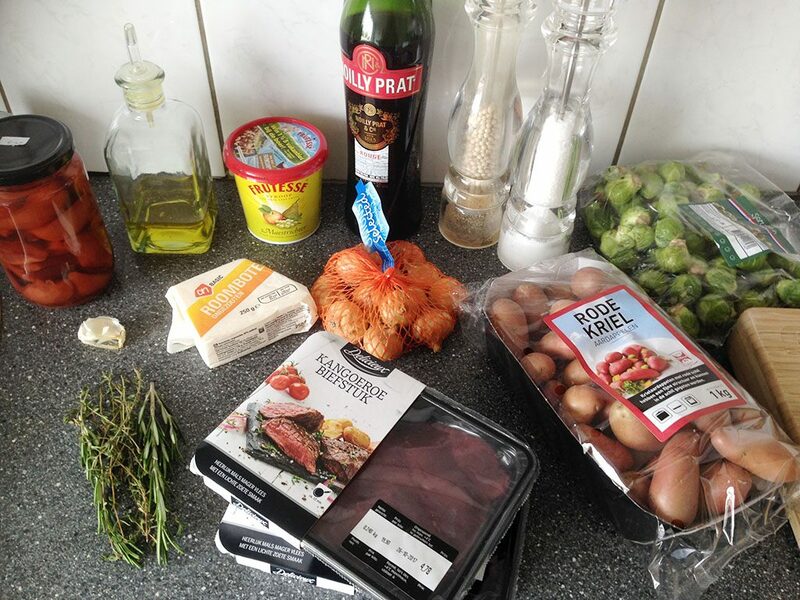 Little potatoes, Brussels sprouts and poached pears to serve with the kangaroo steaks. LET the kangaroo steaks rest outside the refrigerator beforehand. WHEN serving little potatoes, best add them into a oven dish covered with some olive oil, salt, pepper and rosemary & thyme twigs. COOK the little potatoes in about 20 minutes in the oven at a temperature of 180 degrees Celsius or 356 degrees Fahrenheit, depending on the size of the potatoes. CLEAN the Brussels sprouts using a small knife and slice them in two halves. PEEL a clove of garlic and squash it, no need to chop it up. HEAT up a knob of butter along with a splash of olive oil in a large baking pan. COAT the kangaroo steaks with salt and pepper, them cook them for about 3 minutes on each side. COOK for a little longer if you wish the steaks to be medium-well or well cooked. MEANWHILE add in the onions, squashed garlic and twigs or thyme and rosemary into the pan. 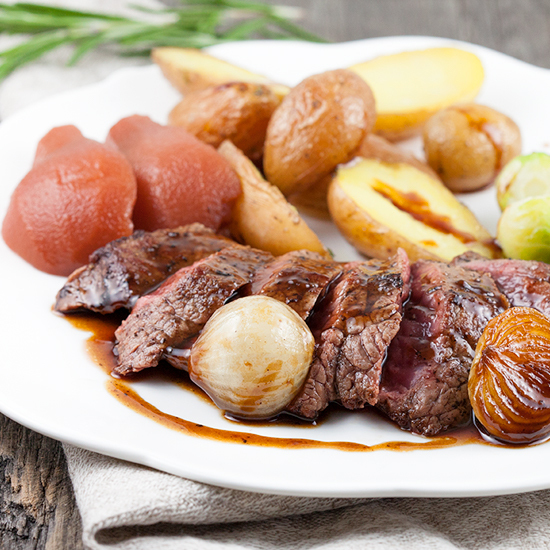 REMOVE the kangaroo steaks from the pan, wrap them with aluminium foil and let rest. POUR in Noilly Prat along with the apple syrup and mix until a smooth sauce forms. SEASON with salt and pepper, then remove the garlic, thyme and rosemary. 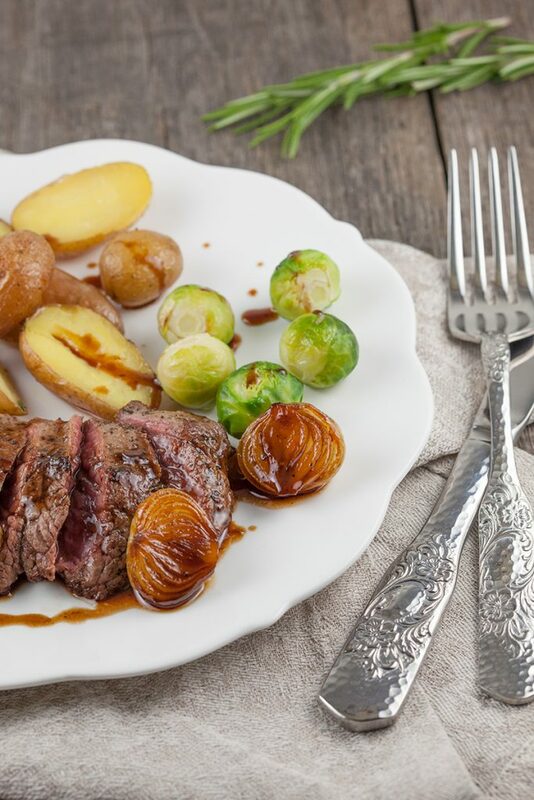 SERVE the steaks with the potatoes, Brussels sprouts and poached pears. ADD syrup sauce and serve directly, enjoy your meal!